Longspan shelving is the perfect addition to your work, warehousing or home area when you need to ensure that your items are stored in an efficient and manageable way. Ensuring an organised storage space, longspan shelving is very popular and is used in a number of different commercial, residential and industrial applications. Rackzone, a 100% Irish-owned company, is committed to providing top quality products at affordable prices which is why all of our pre-owned shelving undergoes thorough checks and examinations to ensure that each item is in perfect condition before sale. 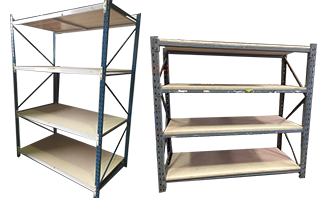 Our selection of pre-owned longspan shelving varies includes, but typically includes: 5 Bay Longspan Shelving,The 5 bay longspan shelving option gives ample storage space and allows you to ensure that your workspace is organised in an efficient and orderly way. Avail of great discounted prices by buying these heavy duty shelves in bulk. The 10 bay option provides all the storage benefits of the 5 bay option but is ideal for larger areas, particularly industrial environments such as factories, distribution centres, stock rooms and storage areas. The longspan starter bay is just what you need to get your heavy duty shelving unit started. Increase your storage space by adding extender bays to your starter bay. Ordering pre-owned longspan shelving is quick and easy through the Rackzone website with next day delivery also available. If you can’t find what you want, give us a call on +353 909673261.